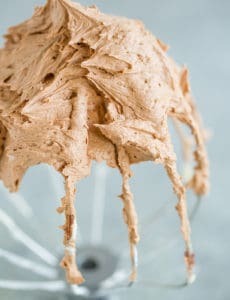 This easy chocolate frosting recipe is the BEST! Made with melted chocolate, it's perfect for cakes, cupcakes, brownies... anything! Place the chopped chocolate in a microwave-safe bowl and microwave in 30-second increments on 50% power, stirring after each, until the chocolate is melted and smooth. Set aside to cool to room temperature. Use immediately or cover with plastic wrap and keep at room temperature for up to 4 hours before using. The frosting can be refrigerated, covered, for up to 4 days. Bring to room temperature and re-whip before using. The frosting can also be frozen in an airtight container for up to 3 months. Thaw in the refrigerator, then bring to room temperature before using.